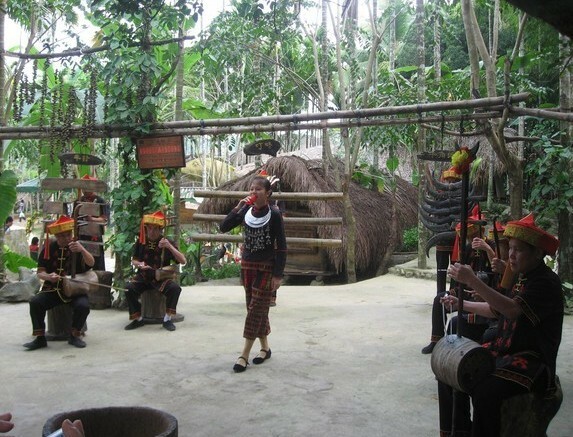 Hainan, China’s second largest island after Taiwan, is the home of the Li ethnic group with a population of about 1.25 million. Most of them live in and around Tongze, capital of the Hainan Li-Miao Autonomous Prefecture, and Baoting, Ledong, Dongfang and other counties under its jurisdiction; others live among people of the Han and Hui ethnic groups in other parts of the island. Lying at the foot of the Wuzhi Mountains, the Li area is a tropical paradise with fertile land and abundant rainfall. Coconut palms and rubber trees line the beaches and people in some places reap three crops of rice a year and grow maize and sweet potatoes all the year round. The area is the country’s major producer of tropical crops such as coconut, arica, sisal hemp, lemon grass, cocoa, coffee, rubber, oil palm, cashew, pineapple, casava, mango and banana. The island is abundant in minerals like copper, tin, crystal quarts, phosphorus, iron and tungsten. There are numerous salt pans and many fine harbors along the coast, and good fishing grounds off the shore. Pearls, coral and hawksbill, turtles of commercial value are found in the coastal waters. Black gibbons, civets and peacocks live in the primeval forests which abound with valuable timber trees. The Lis had no written script. Their spoken language belongs to the Chinese-Tibetan language family. But many of them now speak the Chinese language. A new romanized script was created for the Li ethnic group in 1957 with government help. According to historical records, the term "Li" first appeared in the Tang Dynasty (618-907). The Lis are believed to be descendants of the ancient Yue ethnic group, with especially close relations with the Luoyues – a branch of the Yues – who migrated from Guangdong and Guangxi on the mainland to Hainan Island long before the Qin Dynasty (221-206 BC). Archaeological finds on the island show that Li ancestors settled there some 3,000 years ago during the late Shang Dynasty or early Zhou Dynasty when they led a primitive matriarchal communal life. 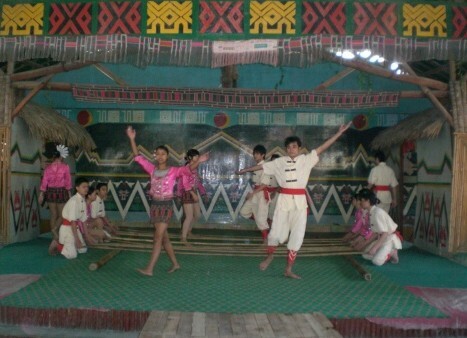 Ethnically, the Lis are closely related to the Zhuang, Bouyei, Shui, Dong and Dai ethnic groups, and their languages bear resemblance in pronunciation, grammar and vocabulary. People of the Han ethnic group began to settle on the island also before the Qin Dynasty as farmers, fishermen and merchants. 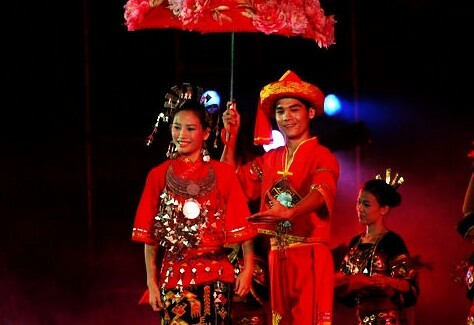 Together, people of the two ethnic groups contributed to the development of Hainan. Later, the Han Dynasty sent troops under Lu Bode and Ma Yuan to set up prefectures and strengthen government control there and enhance relations between the mainland and the island. In the 6th century, Madame Xian, a political leader of the Yues in southwest Guangdong, Hainan and the Leizhou Peninsula, pledged allegiance to the Sui Dynasty. Her effort in promoting national unity and unification of the country not only enhanced the relationship between Hainan Island and the central part of China but also helped the development of the primitive Li society by introducing feudal elements into it. The Tang Dynasty (618-907) further strengthened central control over the Li areas by setting up five prefectures which consisted of 22 counties. In the Song Dynasty (960-1279), rice cultivation was introduced and irrigation developed, and local farmers were able to grow four crops of ramie annually. 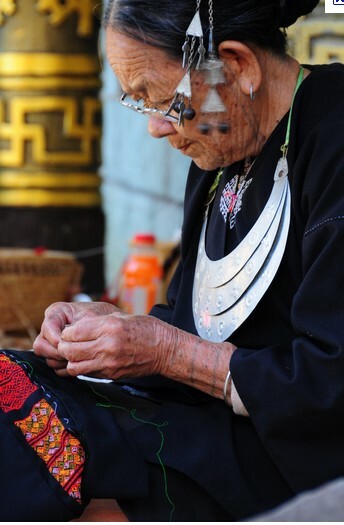 Brocade woven by Li women became popular in central China. In the early Yuan Dynasty, Huang Daopo, the legendary weaver in Chinese history, achieved her excellence by learning weaving techniques from the Lis. Running away as a child bride from her home in Shanghai, she came to Hainan and lived with the Lis there. Returning to Shanghai, she passed on the Li techniques to others and invented a cotton fluffer, a pedal spinning wheel and looms, which were the most advanced in the world at the time. The feudal mode of production became dominant in Hainan during the Ming and Qing dynasties as elsewhere in China. Most of the land was in the hands of a small number of landlords, and peasants were exploited by usury and land rent. Large tracts of land were seized by the government for official use. Only in the Wuzhi Mountains did people still work the land collectively, but even this remnant of the communal system was used by feudal landlords as a means of exploitation. Heavy oppression of the Li people kindled flames of uprising. In the Song and Yuan dynasties, the Lis in Hainan staged 18 large-scale uprisings; during the Ming and Qing dynasties 14 major rebellions took place. After the Opium War in 1840, Hainan was invaded by foreign imperialists who brought untold sufferings to the local Li and Han people, who rose repeatedly against feudal lords and foreign invaders. The first worker-peasant democratic county government in Hainan was founded there, and revolutionary base areas were set up in the rural areas. Soon afterwards, the Qiongya Worker-Peasant Revolutionary Army was formed. The Japanese invaded Hainan Island in February 1939. People of various ethnic groups in Hainan rose in resistance. In the spring of 1944, an anti-Japanese guerrilla force – the Qiongya Column – was formed. It grew into an army of 7,000 towards the end of the war, liberating three-fifths of the island. The staple food of the Li is rice, corn and sweet potatoes, and sometimes they enjoy the fruit of hunting. One of distinctive meals is the bamboo pole rice that is similar to the Dai’s and is wonderful for picnics. It has been said that all the families can smell the fragrance from the bamboo pole rice cooked in one house. The Li people like to chew betel nuts which are considered to be a tonic food with the functions of curing disease and beautifying. So this is women’s favorate snack. Xiang, another kind of Li flavor, is associated with special meals when there are honored guests. Embroidery skills are the Li people’s pride. 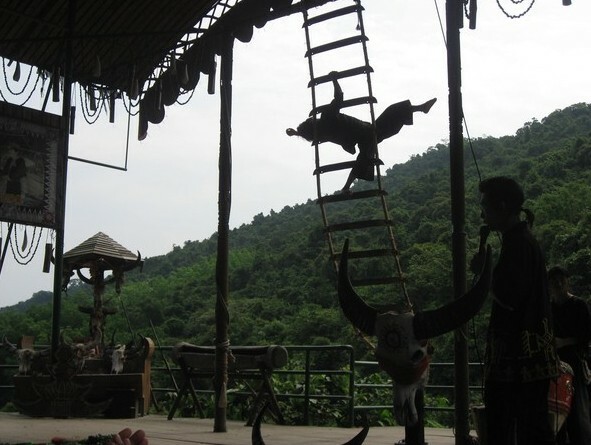 As early as the Tang (618 – 907) and Song (960 – 1279) Dynasties, their skill has preceded the Han people’s. After the processes of spinning, dying, broidering and weaving, silk comes out to be gorgeous and delicate. 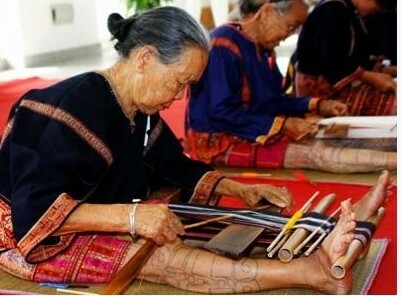 Besides that, the Li have a tradition of dainty and delicate wood-craft. In both styles of a traditional Li house, one in the shape of a ship, the other of a pyramid, the weaving of bamboo vines is an indispensable adornment. Most of the Li festivals are akin to those of the Han people, with their traditional ones as of the Spring Festival and ‘Sanyuesan’. Before the Spring Festival, all the families prepare sumptuous dinners, brew wine and cook Dengye, a kind of cake. It can be stored for a time and after that, it turns to be hard and tenacious. If you cut it into slices and then fry or bake it, then it will take on quite another flavor. On New Year’s Eve, the Li will worship ancestors; the following days, they visit and greet each other as well as sing and dance. Sanyuesan, in Chinese, refers to the third day of the third month when this is celebrated. The elders are honored and visited by other people with yellow wine, cured vegetables and cakes; young people go out hunting and fishing and in the evening, they sing face to face, in traditional flowery clothes, and worship ancestors. This is also a wonderful time to express love to those persons who are dear to one’s heart. When children grow into their teens, they are expected to move from their parents’ house. Boys build their own houses, and girls will be under the authority of their parents. Usually these rooms are smaller than the ones they lived before. This is also the place where the youth find their lover.